Lanyards are an important part of an active fall arrest system and is what connects your full body harness to an anchor point. 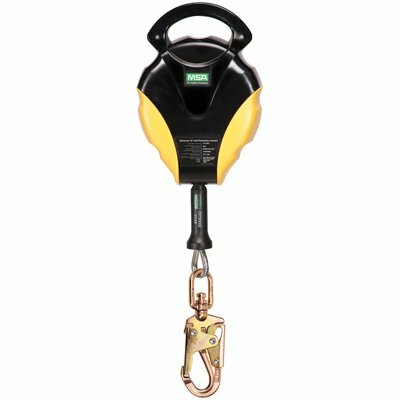 OSHA requires either a shock absorbing lanyard or a retractable lanyard with a minimum breaking point of 5,000 lbs. Besides shock-absorbing or retractable lanyards, we also offer hard-hat lanyards and tool lanyards that not only prevent loss of these two important equipment but also prevent injuries stemming from being struck by these objects in case of a fall. Like your full body harnesses, your shock-absorbing lanyards or retractable lanyards should also be inspected regularly to ensure these perform optimally. Inspect your safety lanyards by beginning at one end and working towards the opposite end. Be sure the hardware is free from corrosion, distortion, cracks or pitted surfaces. The latch should seat into the nose of the snap without binding and is free from distortion or obstruction. The spring should be strong enough to firmly close the latch. Webbing should be free from frays, cuts, breaks or any sign of wear.